"This is my dog Lyle. 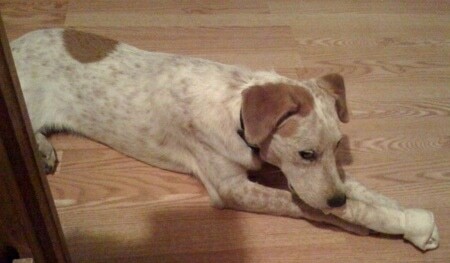 He is a red Heeler Lab mix. He was born on Halloween and is 1 and a half years old. He loves protecting his family by destroying any stuffed animal he finds. He loves playing with our children and making them exhausted. We were so drawn to him from the moment we met him because as you can see he wears his big heart on his side as one of his spots. He always keeps us on our toes and always wants to meet everyone he can find. " The Labraheeler is not a purebred dog. It is a cross between the Labrador Retriever and the Australian Cattle Dog. The best way to determine the temperament of a mixed breed is to look up all breeds in the cross and know you can get any combination of any of the characteristics found in either breed. Not all of these designer hybrid dogs being bred are 50% purebred to 50% purebred. It is very common for breeders to breed multi-generation crosses. "This is Cannon. 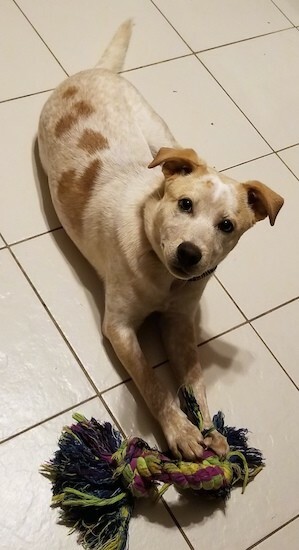 He is a yellow Lab / Blue Heeler cross. I adopted him when he was five months old; he is 8 months old in this picture. He is a very smart animal. Within 1 week of having him he already knew sit, stay and lay. He also took to housetraining very quickly. Cannon is very energetic and loving. He loves to go romping around in the pasture and play with the other dogs. He has done very well with children; he won't nip or jump on them. I would say all in all, he is a very good dog and I wouldn't trade him for anything." 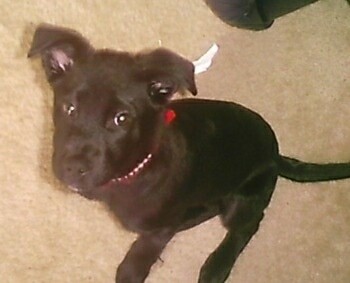 "These are pictures of my dog Piper. She is a Lab / Heeler. In the picture above she is 8 months old, she is very loving, playful and full of energy. She needs to be taken out on walks at least twice a day, and have somewhere to run around. This kind of mixed breed needs to have lots of toys or they will chew things up (bad quirk). Cannot be left alone!! Very good guard dog. Has a very big appetite. Will do good in an apartment, that’s where I live, but must have daily exercise. Does very well with children. I would have to say she is a bird or small animal chaser. Loves to chase squirrels and birds. 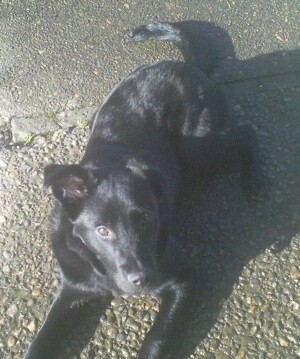 Piper was very easy to train, she is very smart and has no problem following commands."